aboard the area's newest 34' charter fishing boats. 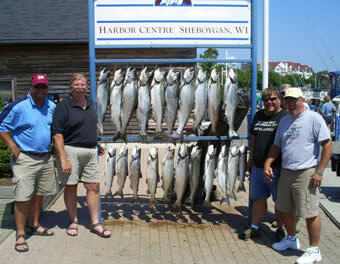 "special charter rates on area lodging"
Sheboygan's first-class charter fishing operation for over 36 years. Come along with tournament winning Captain James Schlegel and his crew for an adventurous big-lake fishing trip of a lifetime. Fish Lake Michigan, the most productive fishing grounds in the world for fresh water trout and salmon fishing. 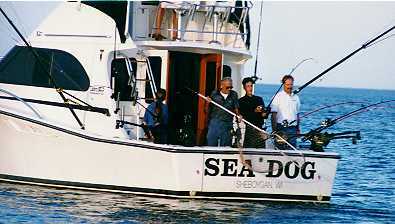 Fish in comfort and style aboard Sheboygan's newest & best-equipped charter fishing boats. We offer two matching late model Luhrs sport fishing boats with lengths of 34'-8" and wide 13' beams. Both are outfitted with the latest in fish finding electronics. Everything is provided including the fish cleaning to ensure your trip is a memorable & rewarding experience. Limit catches are common throughout the fishing season from mid-April to late October. Call now to make your reservations or stop by and see for yourself what Lake Michigan charter fishing is all about. We're conveniently located along the boardwalk in historic Fishing Shanty Village at 701 Riverfront Drive. SHEBOYGAN's #1 GUIDE - For the past several years Captain Schlegel has been Sheboygan's top guide, leading all area captains in both fishing trips and fish harvest. This doesn't happen by accident, but is the result of 36 years in the guiding business. We operate the area's newest 34' charter fishing boats and providing the public with the most detailed charter fishing reports. Our success is driven by our knowledgeable and professional staff and our consistent ability to deliver a quality Great Lakes fishing experience. You'll never find us at sport or travel shows, making exaggerated claims or offering deceptive guarantees. Our advertising is kept to a minimum to hold down costs and our business is based primarily on return guests, old fashion word of mouth and an honest hard work ethic. 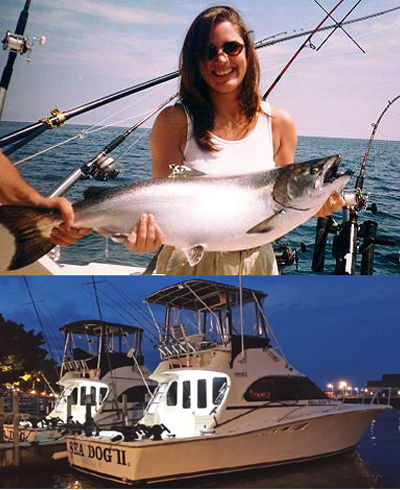 Our unmatched past fishing results and our passion for this sport fishery offers the best charter fishing value in the area and sets the standard for the Lake Michigan fishing charter industry. WHAT TO BRING - Appropriate clothing for weather, tennis or boat shoes, food and beverage, sunglasses, camera, cooler to transport fish home & fishing license (available from the captain at the dock for $14 per person, under 16 years old free). DIRECTIONS - The boats are located on the boardwalk in historic Fishing Shanty Village at 701 Riverfront Drive. To get to the boardwalk, take the Hwy 23 exit into Sheboygan to 6th street. Take a right on 6th street and follow it straight to the boardwalk (Riverfront Drive). RESERVATIONS & PAYMENT - Reservations can be made anytime throughout the year. Our season runs from mid-April to the end of October. A $100 deposit is required to hold your selected date. It is recommended to reserve as early as possible. Your deposit will be refunded if trip is canceled due to foul weather (as determined by captain) or reservation is canceled 30 days in advance of scheduled trip. Payment is due at time of trip in cash or check. Rates do not include 5.5% sales tax. We can also accept credit card payments but will charge an additional 5% processing fee. It is also customary to tip our first mate if you are satisfied with the fishing experience & service provided.